The past few years have brought sweeping changes to what it means to be a B2B marketer. 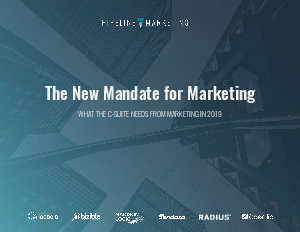 We’re no longer just sending millions of emails to everyone who will give us their email address, the bar for personalization is well beyond changing the first name on an email, and the goal of marketing is no longer limited to hitting a certain lead number. Read this report and Find out what it means to be an impactful marketer in the new world.